​Organic Coffee Beans: FUSED is made from 100% organically grown coffee beans grown on artisian coffee farms in India and Brazil. Most commercial coffee beans have been exposed to pesticides and herbicides and also frequently contain traces of highly toxic fungal poisons (mycotoxins) such as aflatoxin. In one study, researchers purchased 103 varieties of coffee from local supermarkets and found traces of mycotoxins in 99 out of 103 samples. Being made from only organically grown coffee beans makes FUSED healthier than 99% of the coffee that people drink. Infused With Healthy Anti-Inflammatory Seed Oils: Rain International has become famous for creating products from organically grown nutritionally dense seeds. Now Rain has developed a revolutionary new cold-press process that enables them to extract the oils from the following organically grown seeds: black cumin, grapes, pomegranate and grapefruit seeds. 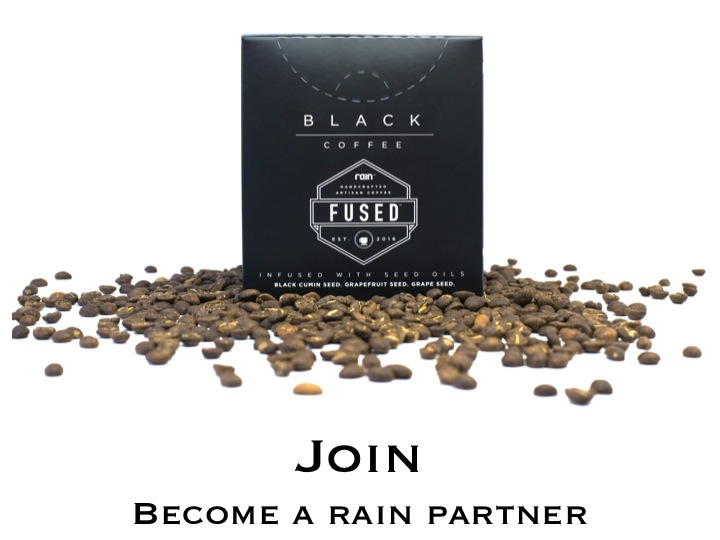 Rain then infuses these oils into its organically grown coffee beans. Each seed provides its own unique blend of nutrients and health benefits, which results in the most nutritious coffee drink in the world. To learn about the health benefits of these seeds, simply Google the name of the seed and "health benefits". Adrenal Support, No Jitteriness, Improved Energy:Rain adds a reishi mushroom extract called ganoderma, which is an immune system-enhancing agent and also supports adrenal function. Many people can’t drink regular coffee because the caffeine causes uncomfortable jitteriness. When people drink FUSED they don't get caffeine highs and lows. Instead they just get a smooth steady energy boost. Hence, people who drink decaf because they are caffeine sensitive find they can enjoy FUSED, due to the adrenal support provided by the ganoderma from reishi mushrooms. 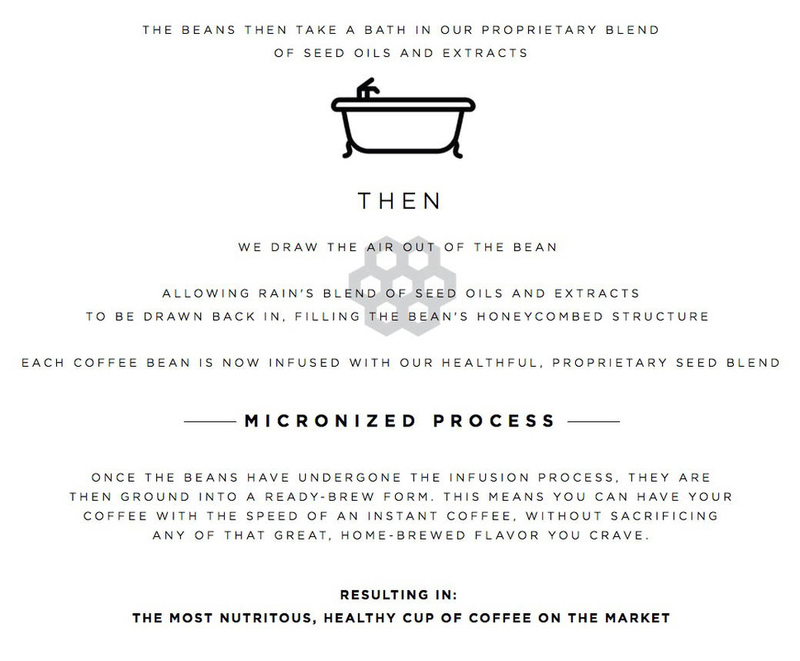 Non-Acidic: The combination of infused healthy seed oils and Rain’s patented process which utilized the whole organic coffee beans makes FUSED coffee non-acidic and non-bitter. 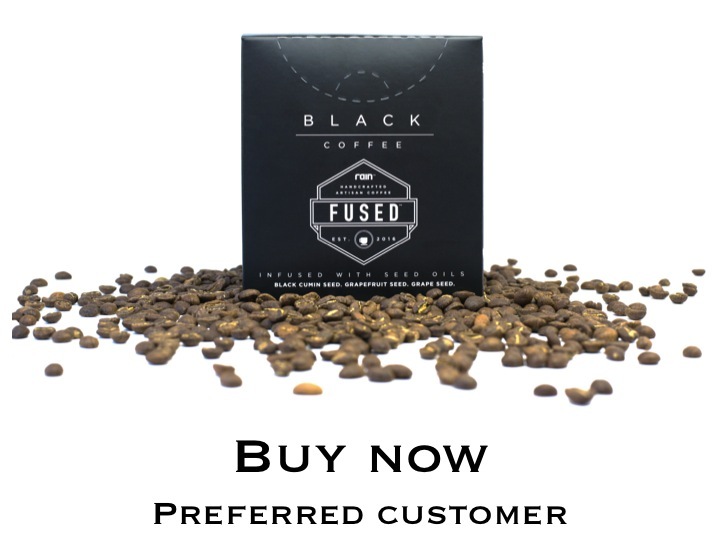 Many people who regularly use cream and sugar to mask regular coffee’s acid and/or bitter taste find they enjoy drinking FUSED coffee black. Instantly Dissolvable: FUSED dissolves instantly in hot water but IT IS NOT Instant Coffee. 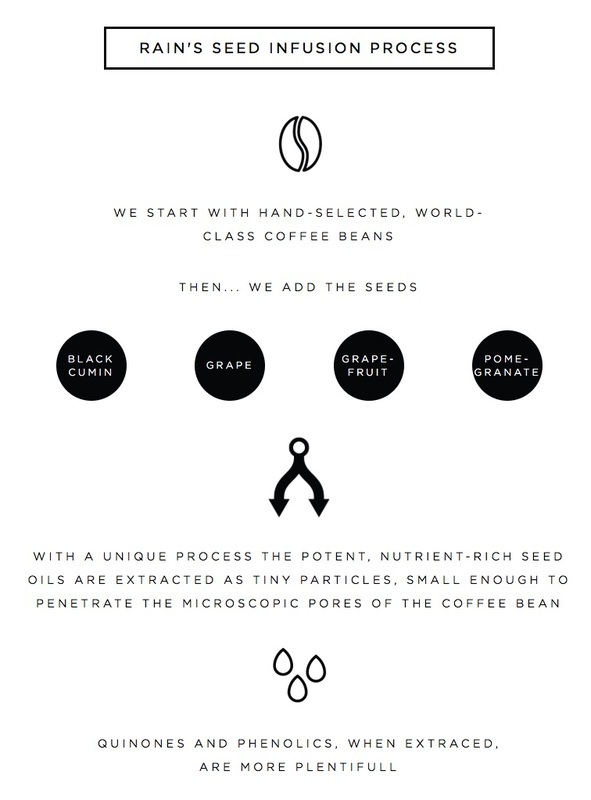 After infusing the seed oils into its coffee beans, Rain utilizes a process that grinds the beans down into tiny fragments called, micronized particle size, which enables FUSED to instantly dissolve in hot water. On the other hand, commercial instant coffee is made from the dregs of the coffee roasting process. Rather than throwing away this debris from the coffee, it is brewed again and then spray dried into crystals that will instantly dissolve, but is essentially devoid of flavor and aroma.